It was 10:45am when I left Berowra station and began heading south alongside the Pacific Highway. There was a footpath, but shortly after it came to an end. I looked across the Highway and saw that there was a footpath on that side of the road. I waited a little while for the traffic to clear, and crossed. Fortunately, I saw as I looked ahead, this footpath seemed to continue for some time. I walked on, and downtown Berowra fell away behind me. Soon after, I saw ahead that the footpath turned right away from the Highway and headed downhill behind some bush and trees. I knew from last night’s research that the footpath most likely connected to Helvetica Avenue, which ran alongside and below the Highway for a while but did not reconnect and ended in a cul-de-sac. I could walk along Helvetica instead of walking alongside the Highway – but before Helvetica’s end, would I be able to get back up to the Highway? I decided to take a chance with Helvetica and hope that, somewhere along the way, there was a lane or empty patch of ground that would enable me to reconnect to the Highway. About 10 minutes later of pleasant-looking suburbia that I had no idea existed just below this stretch of the Highway, the welcome sight of a lane appeared. I walked back up to the Highway. …but after the turn-off into Preston Way, it was hilly and impassable bushland right up to the narrow cycling lane that ran south alongside the Highway. I looked across the road. It was the same over there. For a moment, I considered crossing over to continue walking along the ‘right’ side of the Highway to go with the flow of the southbound traffic. But as always the Highway was busy, the nearest pedestrian lights were some distance back, and especially with no footpath over there what was the point? So I remained on the ‘wrong’ side of the road and began walking south. And along with my crossing of the Gladesville Bridge just over a year before, the next 30 minutes or so would be one of my most uncomfortable long-walk experiences ever. Ever since, and even at the time as I walked that roadside stretch, I wondered if I perhaps felt more self-conscious rather than genuinely concerned. Did I look foolish walking alongside the busy and this-not-very-scenic-part of the dangerous and notorious Pacific Highway – and on the ‘wrong’ side? A few times I told myself to knock it off. Most of the passing drivers probably didn’t care what I was doing – and even if a few did, so what? But self-consciousness aside, I was genuinely concerned. The cycling lanes on both sides of the road were narrow, and even if I had been on a bicycle instead I wouldn’t have found it comfortable. If a vehicle came off of the Highway at speed right at me for whatever reason, I had nowhere to go. It didn’t feel very safe at all. …although funnily enough, walking on the ‘wrong’ side of the road soon calmed me down a little because if something came at me, I would see it coming – whereas on the ‘right’ side of the road, a vehicle or cyclist or something else could hit me immediately from behind. So I focused on just walking safely to get past this godforsaken part of the Highway. At one point a car did suddenly pull up not far ahead of me, and at another point either a cyclist or a jogger came the other way (I can’t remember now if he was riding or running), but because I was very present-in-the-moment I was prepared. But it wasn’t very pleasant, nonetheless. Except for one brief moment. When I came to the stretch of the Highway that overlooked the large green valley that contains Lyrebird Gully and the overhead-powerline towers marching off into the western distance, I stopped and admired the view. I didn’t stay long and I couldn’t see much through a narrow gap in the roadside foliage, but it was enough. I smiled, thought about my very young self when he first saw this sight about 40 years ago, marveled that I was now admiring it on foot, and then pressed on. Not long after the valley, I came around another bend in the Highway and smiled at what lay ahead. For the next few hundred metres, there was a nice expanse of flat wide ground running alongside the Highway. 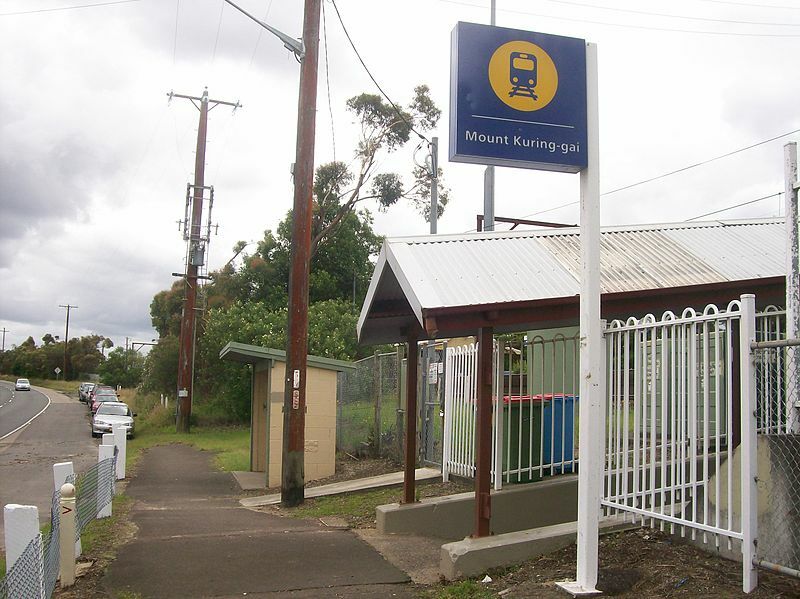 And not long after, when I looked across the road at the western entrance to Mount Kuring-gai railway station, I grinned at an even more wonderful sight. Stretching ahead for as far as I could see for at least a kilometre ahead, and with several metres of space between it and the Highway, was a footpath. I waited until it was safe to cross, and did. And for the first time during that walk as I began heading south along the footpath, I relaxed and began to truly enjoy my journey. The funny thing was, about 10 minutes later I crossed back over the Highway – but this time high above it, across the Church Street bridge. And I crossed it to reach another wonderful sight – an ALDI. I bought a bottle of chilled water there, and at 11:50am took my first break. Especially after that tense first hour, that break and water felt wonderful. And as I looked out of the ALDI at the Highway as it continued south, I grinned at the sight of even more footpath stretching off as far as I could see. At 12:05, I finished my water and binned my bottle. 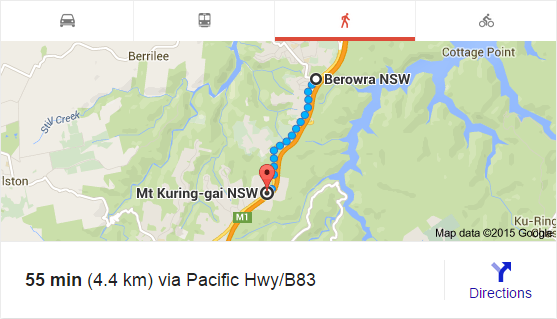 I had walked just over seven kilometres from Berowra to Mount Kuring-gai. Hornsby was another 15 kilometres away. I resumed my journey south to find out. This entry was posted in Action, Fear, Hope, Inspiration, Life Challenges, Life is Good, Travel. Bookmark the permalink.